For three years during the early 1980s, I walked past the Collegio Romano every day on my way to classes at the Pontifical Gregorian University. Founded by St. Ignatius in 1551 and originally housed in rented rooms, the Collegio grew quickly. An early alumnus, Pope Gregory XIII, expropriated an entire neighborhood in the heart of Rome and built an immense college complex in the 1580s, spending 4,100 kilos of silver on the project. The Collegio, whose Jesuit-designed façade is second only in scale to St. Peter’s, housed aulas, courtyards, music rooms, a botanical garden, an observatory, a pharmacy, a museum, residences for faculty and Jesuit students, and an immense library. The six-square-block complex was eventually completed with the construction of the grandiose college chapel of Sant’Ignazio. With the downtown Collegio and their headquarters at the Jesuit mother church, the Chiesa del Gesù, just a block away, the early Jesuits and their papal sponsors succeeded in creating a prototype, a pole, a landmark. In a word, in midst of the confusing jumble of the city, they created a place. They wanted to be at the center of the action, in dialogue with the urban scene. Jesuit educational institutions have attempted to do so ever since. For two-thirds of my life, I’ve inhabited Jesuit places. Sacramento’s Jesuit High in the 60s, emerging out of hop-fields, then the ancient gardens of Santa Clara University, next to the Mission Church where 15 years later I would celebrate my first Mass. Fordham’s Rose Hill in the late 70s, as the Bronx burned around us. San José’s Bellarmine, then Rome and then Berkeley. A stint in the nation’s capital was followed by 18 years at USF and work in Shanghai. Now I find myself in Seattle University’s urban oasis in the midst of hipster-riddled Seattle. Join the Jesuits, and you’ll live in interesting places and be in the middle of the mix. The 16th century building of Collegio Romano (Roman College) founded by Saint Ignatius Loyola. Meaning. Memory. Continuity across generations. Echoing halls and yards where important words establish identity, define vocation, envision destiny. Vows, promises, commitment, demands made and responded to. Rarely does an airline terminal or a fast food joint serve as a vessel to contain these complex attributes and activities. Yet a book falling open to the right page in the back of the philosophy stacks of the library, or a chance encounter in the quad that leads to coffee and an all-night conversation, or the sweet smell of a century of beeswax in the chapel, or flying a kite off a forbidden classroom rooftop in the moonlight, all create a place that remains within us long after our college days are ended. We have inhabited a place, a place that mysteriously travels with us even as we leave it. If we listen to the poetry of Genesis, humanity’s first schoolroom was a garden, a laboratory in which our ancestors developed both taxonomy and their all-too-free wills, where they conversed with the Lord in the cool of the evening. Plato withdrew from the Academy into a garden secluded yet in sight of the city, there to ponder and to converse with his students. For many, perhaps most of us, our first campus for exploring the world was our mother’s or grandmother’s garden, and for me, at least, my first remembered transgression was climbing over its low fence to explore the greater green world beyond and climbing back over before I got caught. It’s no accident that medieval monasteries were arranged around ambulatory gardens, and that both St. Ignatius and St. Peter Canisius, his most skillful college founder and real estate developer, insisted that every college should have its own urban garden and its own house in the country where its students could escape the mal-aria of town. 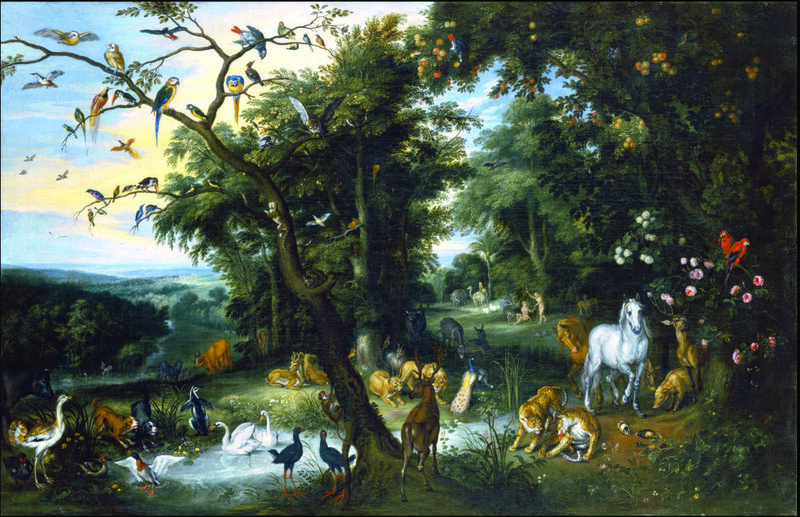 The Garden of Eden, by Jan Brueghel the Elder. Circa 1655 and circa 1661. This image of garden as a metaphor of place has ramifications when we apply it to an institution of higher education. In each, roots are set down, nourishment taken in, growth encouraged. A garden and a college are cultivated, ordered entities: a literal campus, a field with their own memory and history. They are places that invite reflection, astonish us in their diversity, open us up to beautiful forms of life, provide quiet corners for conversation and bowers for young lovers. Both require immense hard work and constant attention, pruning, weeding, and watering, all in due season. Yet the image of the medieval cloister or the Hortus Conclusus, the walled enclosure entered into through a locked postern gate and accessible only to a few, is far removed from Ignatius’ notion of the place of the college in early modern culture. Having studied at Alcalà, Salamanca, and Paris, he evolved from his hinterlands origins into a thoroughly urban being. His Society and its institutions were to occupy the town square, not remote monastic mountaintops. With those marching orders in hand, Jesuits became place-makers, conversation partners in the great cities of the Catholic world and in the new frontiers of the Spanish and Portuguese missions. From Rome to Messina and Manila, Goa to Gdansk, Vilnius to Vienna, Jesuits built educational complexes of bewildering variety and sometimes startling beauty. College buildings served not only the educational needs of their (male) students, but served as centers for scientific research and rich artistic and theatrical production. The non-parochial college churches opened their doors to all in the urban scene, to rich and poor alike, and their sodalities brought spiritual support and opportunities for participation to men and women across many spectra of class and culture. To recall Brueggemann’s definition, the Jesuit college-church complex became a place where important truths were spoken, where significant, life-changing engagement could develop and vocation be confirmed. I take hope in the fact that the red thread that unites the 16th century Collegio Romano to the hop fields of Sacramento to the glades of post-modern Seattle University is a lived conviction that it remains possible to discover meaning in this world and to share that meaning with the generations that follow us. Our core values and teachings that are grounded in memory and hope still need places where they can be given root room. Our humanistic tradition that grows out of the compassion of Christ and the Sages and from the passion of Ignatius and his colleagues still makes its valid demands and calls for protest against unpromising escapism. We are not angels; we live in a physical world of here and now, embodied not in random space but in human and divine place. A virtual world is Noplace, no place for humans to inhabit. As educators in the Ignatian tradition, we inhabit a university, a little physical universe rich in possibilities that grow out of the soil of memory and tradition. Weeding, pruning, and watering, we commit ourselves to these places, to create and recreate them anew, well aware of the hard challenges that await our students and ourselves within, even as we reach outside our gates. Here we place ourselves in solidarity, in an age-old community of scholars, guides, and seekers in dialogue with each other and with our neighbors. Here takes place the union of past, present, and to come, and from this place, perhaps, together we can find our way home. Fr. Thomas Lucas S.J,. is rector of the Arrupe House Jesuit Community and University Professor and Curator at Seattle University. His book Landmarking: City, Church, and Jesuit Urban Strategy (1997) won an AJCU national book award in 1999.